This is an important critical fact that most Singaporeans have ignored for decades and despite of such reality, Singaporeans are still pumping huge amount of money willingly into HDB resale market which in turn, pushes up the new BTO HDB flats! This is called market forces at work mah. As economics 101 will teach you, the worth of anything is measured by the biggest amount of money the market is willing to pay for it. Similarly market forces also make PAP won 70% votes while parties like PPP won only 23% votes, and despite PPP being led by a veteran, credible and economics trained (and from the prestigious NUS some more) political leader. So sad. No wonder this political leader even once harboured the thought of quitting politics altogether. Enough of party hopping, party forming and party leader. 1. Monetising of the HDB is for retirement, not asset transfer to the next generation. It addresses some of the issue of wealth transfer that widens the income gap and disadvantages those that do not benefit from wealth transfers. There are lease buy back schemes to monetise the HDB for retirement. 2. You mentioned oversupply with people dying off and beneficiaries having been forced to sell due to HDB rules. Shorter leases also leads to lower resale prices. At the same time, you feel that new HDBs are over-priced and should be priced cheaper. 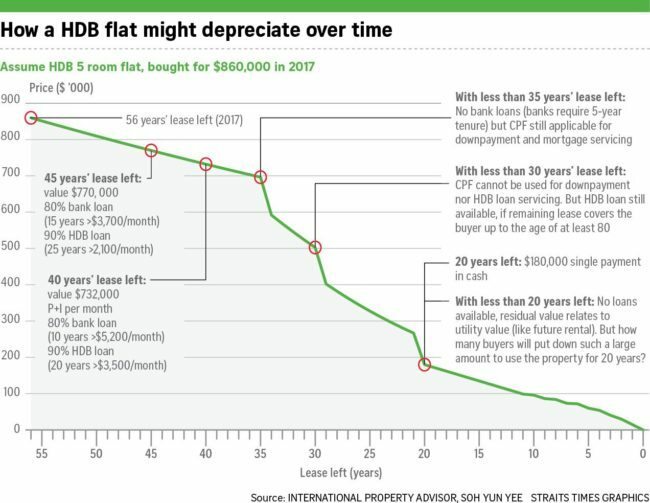 Well, I think that if population growth is somewhat controlled, then the market will likely find an equilibrium when HDB can reduce the number of new flats being built, while older flats in matured estates, which are a huge draw currently, are priced cheaper because of the factors you mentioned. That equilibrium will ensure that public housing, will generally be affordable for the majority. 3. SERS is like a lucky draw. It only benefits a small group of people and I'm glad is to be scrapped. 4. It was advised for everyone to consider the length of the lease when paying for a resale HDB. Caveat Emptor. Perhaps you are barking up the wrong tree and it is those that are touting SERS and driving up HDB resale prices that should be taken to task. And that was precisely the Minister's point. 1) First of all, HDB cannot be effectively "monetized" for retirement if the value of it is going to dip drastically after 50 years. Have you tried using the Lease buy back scheme? It is just like making you like a beggar begging for money! The Lease Buy back scheme is illogical and "relatively under-priced" as compared to current situation. 2) If someone sell at higher price, that means there is someone who is the sucker. If someone buy at lower price, there must be a sucker as well. There will be Disequilibrium which will lead to a terrible crash in the system before that "balance" or "market equilibrium" could be reached. As long as PAP continues its totally irrational pricing policy of hedging BTO prices to market prices, we will definitely face that crash eventually. As long as the resale market is pushed up by irrational population growth outpacing building of new flats, we will definitely crash one day. It is a bit hard to explain this but the supply and demand of housing is quite different from the normal supply and demand logic of other goods and services. 3) The point is this, if SERS is not done systemically, we will definitely face a horrible and terrible situation whereby HALF of Singapore's HDB estate will have HDB lease expiry in 2060-2080 and where are you going to create enough housing to house those who are staying in these flats? We have to get into the second development phase of "phasing housing needs". 4) Nope. I don't think I am barking up the wrong tree. The ROOT of the problem starts with PAP's Asset Enhancement Scheme without telling Singaporeans they have to "Monetize" their HDB flats later for retirement. And then, they screws it up by releasing HUGE liquidity from CPF for people to buy HDB flats, pushing up the prices. Asset Enhancement Scheme is the biggest time bomb implanted by PAP government ever because it created unrealistic expectation from the population but now, PAP turns around to talk about Caveat Emptor? Get a new govt to change the assets policy and rules might help in maintaining stabilizing HDB property prices. It is just rules to play. Can comes out minimize 5 years occupation period. Change allow citizens to use CPF. It all depends how citizens voice to the current govt and allows a good long term plan to change for future generation. If not is will be a time bomb, we have allow the current govt to this to citizens. Why not the current govt think out of the book. I believe singapore properties will not go down if the current govt is looking into it. I believe inflation will still goes on. Get a new govt to change the assets policy and rules might help in maintaining stabilizing HDB property prices. How to, when even the strongest among the opposition themselves said they are not ready to be govt? And seriously speaking, had the opposition, instead of PAP, won 93% seats in GE 2015, what kind of govt will it be when Goh Meng Seng, Chee Soon Juan and Low Thia Khiang are not even on speaking terms with each other, let alone work together to form a better govt than PAP? So any wonder why they lost so badly contesting 100% seats in GE 2015? Simply because majority voters were not taking any chances by electing such a govt. As economics 101 will teach you, the worth of anything is measured by the biggest amount of money the market is willing to pay for it. To add "...or the market is forced to pay for it". With an aging population and flats have already been milked for what it is worth, the prospect of "pay back time" is looming nearby. Hong Kong has a lot of leasehold properties too and property prices per square feet are higher. Do the majority of residents there worry? Will any government ignore such potential factor which may trigger social unrest and instability? No! Government will work out something to resolve it.HK will face thus issue earlier than Singapore because flats there are older in the average. So, let's learn how HK government handles it and make some improvement. Time bombs are overflowing everywhere. Violence are erupting and surfacing at all levels. Ownership at the top are only interested in viewing through the lens of addressing the best in township. Third grade leadership. We enbloc from hudc buy exec condo. You many many money take from stamp duty. You rich I rich. No jealus come out rule to collet much money from people. We knew enough psychology to have some insight that the 99 years and those below 2M properties will be vibrant for those HUDC enbloc replacements. Praise the Lord. Possessions, outward success, publicity, luxury - to me these have always been contemptible. Some ministers just do not have the same level of wisdom than the old ones who always have the ability to think strategically . If they speak the truth that when they fill up one hole for themselves they create more for the average people. They may choke on their words if they admit to this. There is no way anyone can judge how volatile the housing market. Our perceived true moral leaders don't even know about stabilizing. They are only up there acting as dejavu circuit breakers instead of cultivating the intuitive judgement on how to increase monetary movement. Week after week, year after year nothing has been transformed on progress in people's lives. We have been experiencing suppression slowly and spiritually our motivation to reach that rainbow has been decreasing. Phuck them! Gentlemen it is with considerable regret that you are being informed that obviously most of us hold some very low opinion of you. That's what si jee task too structured and stifle the people's need for variety.